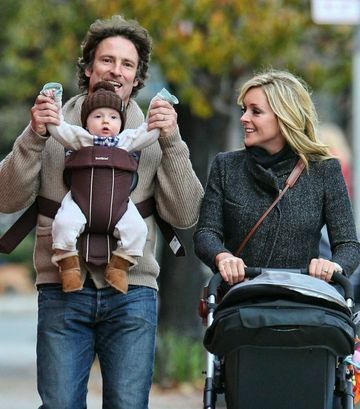 Jane Krakowski and Robert Godley welcomed the arrival of their baby boy, Bennett Robert Godley, April 13 in New York. The happy family was spotted taking an afternoon stroll in New York City in November. Image courtesy of Celebrity Baby Scoop. Rachel Zoe and Rodger Berman welcomed a son, Skyler Morrison Berman, March 24 in Los Angeles. Mom took 8-month old Skyler, dressed in a cute gray hat and sweater to an art gallery in West Hollywood. David and Victoria Beckham welcomed their fourth child, Harper Seven Beckham, July 10 in Los Angeles. Spotted at LAX airport, Victoria held 4-month-old Harper wearing an adorable pinstriped dress and tights. Jessica Alba and Cash Warren announced via facebook the birth of their second child, Haven Garner Warren, on August 13th. Spotted at Disneyland over Thanksgiving weekend Jessica Alba holding 3-month old Haven. Selma Blair and Jason Bleick welcomed son, Arthur Saint Bleick, July 25th. Selma Blair carried her blue-eyed boy, nearly 4 months, to Dancing Shiva Yoga and Ayurveda in Los Angeles. 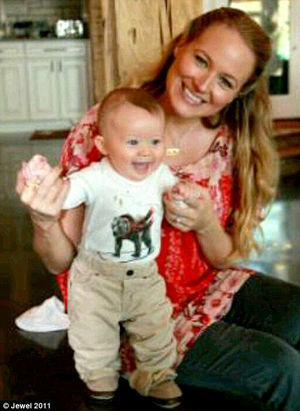 Jewel and Ty Murray welcomed a son, Kase Townes Murray, July 11 in Texas. Jewel posted this new photo of her 4-month-old son on her blog, "Thought I'd share a pic of the baby taken on Thanksgiving- he is the happiest baby!" Kate Hudson and Matt Bellamy welcomed a son, Bingham "Bing" Hawn Bellamy July 9. "For those wondering, Bingham is my mum's maiden name," Matt tweeted. "Bing Russell was also Kurt [Russell's] dad. Family connections all round!" Dressed for autumn Mom carried 3-month-old Bing in London. Tori Spelling and Dean McDermott confirmed the arrival of their daughter Hattie Margaret via Twitter: "Our family's so happy 2 announce tht 10/10/11 R baby girl Hattie Margaret McDermott was born at 7:08am! Xoxo".